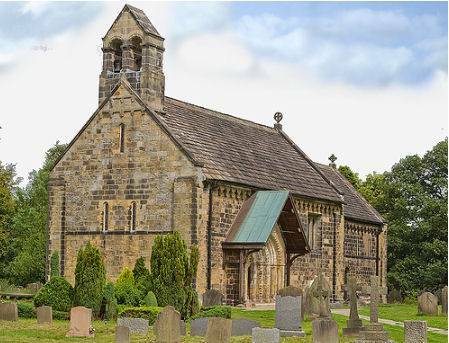 Adel is situated on the northern outskirts of Leeds and is most notable for its historic Norman Church of St. John the Baptist, which has been described as "one of the best and most complete Norman churches in Yorkshire". The building was constructed between 1150 and 1170 and occupies the site of an earlier, Saxon church. It has been little altered since then, with the exception of the bell-cote which was built between 1838 and 1839. St. John the Baptist is one of the oldest churches in West Yorkshire still in use as a centre of Christian worship. The church is completely ringed with carved heads and double-head decorative corbels. The doorway, which is protected by a modern wooden roof, has an ornately carved Norman arch. The chancel arch has 37 grotesque beakheads. The medieval font has an oak canopy and what is possibly a leper's window survives in the chancel, although the evidence for this is poor as the nearest known Leper Colony was situated some distance away and other churches were much closer. 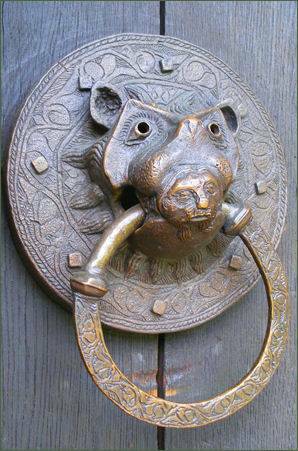 The doorknocker, often referred to as a Sanctuary Ring, of Adel Church is a replica, as the original was stolen. Adel is situated near the site of a Roman fort, the ancient road from Tadcaster to Ilkley passes nearby. The Romans knew the area as Burgodunum. It is possible that an Anglo-Saxon village sprang up around the fort. Most authorities claim the name derives from the Anglo-Saxon adela meaning 'dirty, muddy place', but claims have also been put forward for the Saxon personal name Ada (or similar Anglo-Saxon names such as Eadda, Eada or Ædda) and the Anglo-Saxon leah meaning 'open ground, lea' Adel is mentioned in the Domesday Book of 1086 as Adele. Several inscribed stones from the Romano-British period have been unearthed in Adel, also a number of Anglo-Saxon stones were discovered in the church foundations during restoration work in 1864. Some of these items are on display in the Leeds City Museum. York Gate Garden lies behind the ancient church. The garden was created by the Spencer family between 1951 and 1994, Frederick Spencer laid down the basic structure of the garden, his son, Robin, was largely responsible for its development. York Gate Garden was undoubtedly inspired by some of the outstanding gardens of the Arts & Crafts movement such as Lawrence Johnston's Hidcote. The garden is now owned and cared for by the charity Perennial to whom it was bequeathed in 1994 and is open to the public. Adel Dam Nature Reserve which straddles Adel Beck, is a tranquil reserve and is home to around 36 different kinds of native and exotic trees, kingfishers, the dam's main attraction, can often be spotted, chaffinches, nuthatches, woodpeckers, sparrowhawks, red kites and buzzards are also often sighted there. More elusive species include water rail and lesser spotted woodpeckers. There are fine displays of bluebells and marsh marigolds in the spring The site has been noted for its special ecology since 1830 and has been a nature reserve since 1968. Adel Crags lies nearby as does the Meanwood Valley Trail, a waymarked footpath which runs for 7 miles (11 km) from the statue of the former Leeds mayor, Henry Rowland Marsden, on Woodhouse Moor, close to the University of Leeds, through Headingley, Meanwood and Adel to Breary Marsh, Golden Acre Park, where it meets the Leeds Country Way.